Back in October, I was invited to attend an event in a small town in Tuscany for the 10th anniversary of the death of beloved Barcelonian writer Manuel Vázquez Montalbán. He was a smart man who appreciated good food and wine, so it’s hardly surprising that he loved Italian cuisine and had visited the area many times. There wasn’t better excuse to spend a long weekend discovering the food and wine of the area myself. This is a long overdue account of the trip. 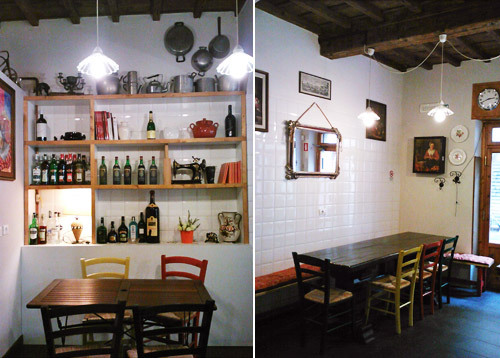 Upon my arrival in Florence I had lunch in a random little osteria called La Vinaina that had a set lunch menu for 12€, with a few choices for each course. The pasta was perfectly al dente–of course–and the polpettine (little meatballs) with spinach were perfectly juicy and delicious. I can’t remember the name of the house wine, but it was naturally, a Chianti. Not only very quaffable but also very affordable. I started to wonder if I would survive the following four days of eating and wine drinking. Once I stepped out of Florence and into the Tuscan countryside it was lush and green everywhere, especially at the wineries I visited. Priorat, one of the wine regions in the world I know back to front, is now promoting itself as a top destination for wine lovers and developing its enotourism potential which is long overdue. For some reason though, I’ve seen several articles comparing it to Tuscany, which couldn’t be further from the truth. These two regions seriously have nothing to do with each other. For starters, Priorat has one DO appellation and one DOQ, while Tuscany has, brace yourself, 37 DOC plus 9 DOCG (the Italian versions of DO and DOQ). Madness. Chianti is one of the most popular Italian wine regions, with the most wineries and with the most production. So it’s quite complicated to master all the nuances of the types of wines made under the Chianti umbrella, but it sort of boils down to this: Chianti Classico is the “original” Chianti region that has its own consortium and the pink label with a rooster logo, then there are eight other sub-regions that have an adjective attached to the name Chianti and are also considered of high quality (so DOCG) and the rest is just Chianti without any qualifier and can be of varying qualities. These non-Classico zones can also produce Chianti Superiore. The wineries I visited where all in the Arezzo Wine Route area, thus in the “Chianti Colli Aretini” area. And, needless to say, I was very pleasantly surprised. Like Jancis Robinson wonderfully put it, “A good Chianti is very definitely an agricultural product. It suggests farmland, sometimes even a farmyard”. The first winery I visited was the Fattoria di Migliarina & Montozzi, located in the village of Levane just 5 or 6km from Montevarchi. By the way, while most wineries are called Azienda Agricola, which means something like farm, this one is called Fattoria which is apparently a synonym. The winery is on an impressive 500 hectare estate with about 50 of vineyards and 30 of olive trees and comprises the Fattoria Miglarina where the winemaking facilities and tasting room are located along with a few cozy apartments they rent as agriturismo. 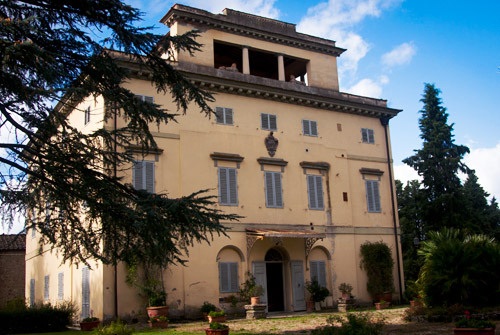 Next to the winery they have a swimming pool and a soccer field where they host wine tastings when the weather is good, and in the back there’s a small chapel and Villa Martini built in 1829 that has also been turned into a tasteful B&B (pictured above). 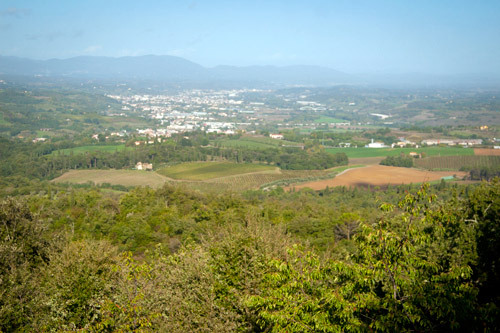 About 2km from the Migliarina complex lies the Montozzi Castle on top of a hill, with views of the enture Valdarno valley (pictured above). It’s a another beautiful historical property that is unfortunately closed as it still requires renovations after it was occupied and then set on fire by the Germans during World War II. Owing to a strategic marriage by two families a few generations ago, these days it is all part of the Bartolini Baldelli family. Carlo is a young dashing winemaker who wears impeccable clothes and used to work at a bank but, wanting to make the most out such a gorgeous estate, a few years ago decided with his cousin Antonio to revive the family’s winemaking tradition and start a full-fledged winery. As he showed me around he was beaming with pride and excitement talking about all they’ve acomplished in a very short time. 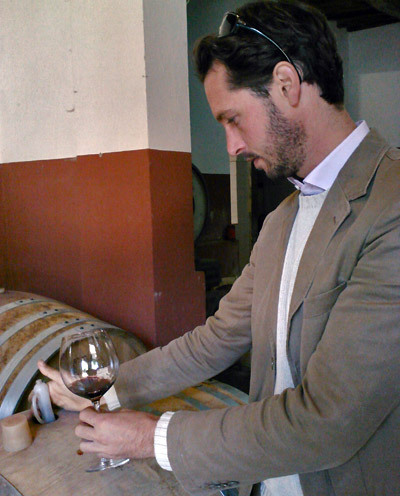 Just this year they’ve released a new wine aimed at young consumers called, Vinyl and they’re also one of the 20 or so wineries that have promoted the new DOCG certification of Valdarno di Sopra that was approved this year (their Castello di Montozzi 2011 is the first wine to obtain this certification). Out of the wines I tasted, my favorites were the Cavasonno 2011 and the Castello di Montozzi 2011. The first is a blend of only 40% Sangiovese, which is usually the dominant grape in the area, with 40% Cabernet Sauvignon and 20% Merlot. It is fermented in cement tanks and aged only in stainless steel, which gives it a very fruit forward character. At 8€ retail, it has an excellent price-quality ratio. 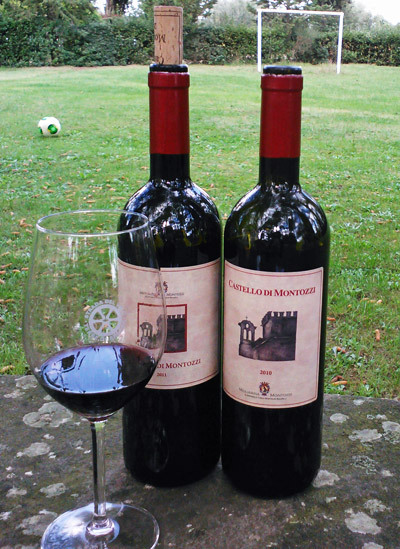 As for the Castello di Montozzi, it was interesting to compare the 2010 and the 2011 vintages. The latter is almost 95% Sangiovese, while the 2010 had 15% of Cabernet blended with it. This is a Riserva wine that spends a year in oak barrels, so it has quite a different character than the Cavasonno or their Villa Miglarina wine that has a similar blend. The 2010 started with fresh red berry notes in the nose that in the mouth became more matured, with subtle herbs and pine cone flavors, and a long persistent ending. The 2011 vintage was a bit more floral, with violet and subtle cherry aromas, and even though the 2011 probably needed more time in the bottle, it showed a remarkable evolution. If I’m not mistaken, its retail price is 19€. 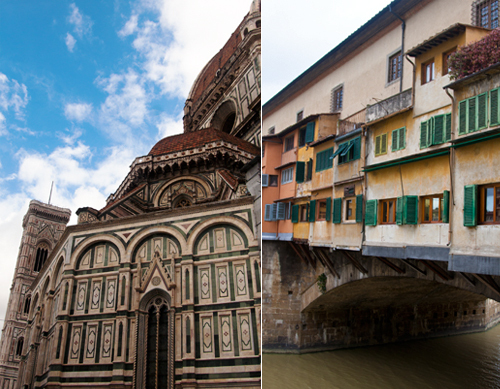 Read Part 2 of “A glimpse of Chianti in the fall”.